The Audi A1 resides firmly in the supermini class of car. Its premium feel may play into the more sophisticated driver’s hands, but a used A1 remains a fantastic car for most drivers. First launched in 2010, it’s super stylish and takes on a similar shape and build of other Audis – which is always a good thing. 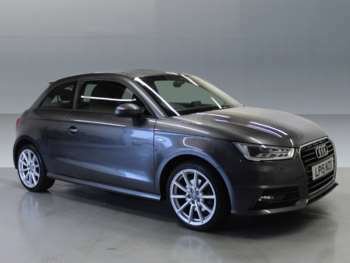 We display a range of used Audi A1 cars available from accredited dealers across the UK. A used Audi is full of equipment, so there’s plenty of gadgets and necessities that make the A1 a great buy. The usual aspects of every Audi are there, including the airbags, leather, seating position and build quality. It feels like the entire car has been put together incredibly well, which is what the German manufacturers are known for. Audi is synonymous with build quality, and our second-hand Audi A1s for sale are sure to prove that. With its dynamic looks and state-of-the-art technology, both the interior and exterior of a used Audi A1 are unrivalled. You’ll never find a similar car in the same category that comes with its features. Much of the A1’s driving prowess comes from Audi’s incredible DSG system. This is basically a very clever flappy-paddle gearbox, but it’s much more than just a marketing ploy. The gearbox effectively makes the car better, so it’s definitely something to consider. Aside from the gearbox, a used A1 drives brilliantly and boasts technical superiority. The A1 is by far and away the most technically-gifted supermini, so that means you’ll enjoy a brilliant drive no matter where you are. The TDI engines in the A1 are superb, and even if you opt for a petrol model, you’ll be boasting a smile for years to come. As the saying goes, good things come in small packages.